Capturing Clever Comedy, Frame by Frame with a Trusty Camera. 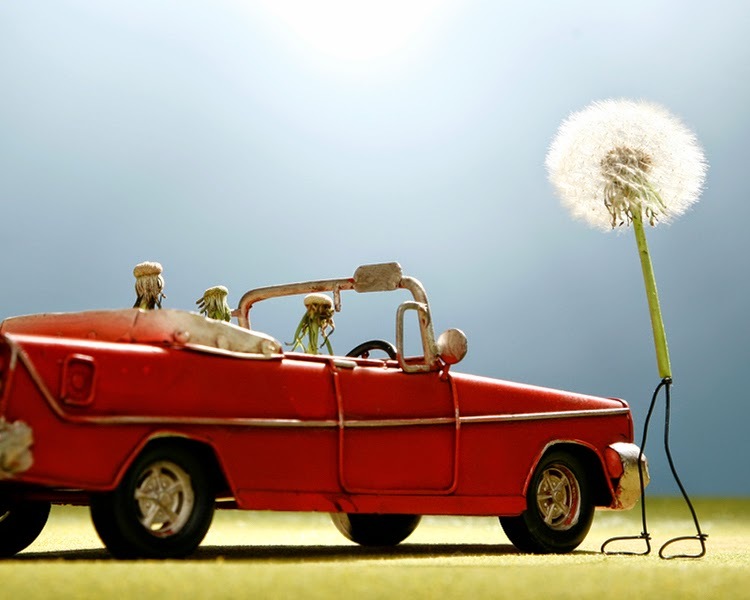 Snappy Snapshots of Staged Props to Make You Think & Laugh. Photographer Terry Border is no stranger to irony and interesting juxtapositions. In fact, his foray into Comic Photography stemmed from years of straight-laced Commercial shots, what he himself eventually found to be "mind-numbingly boring." So after years in the business, he decided to go to the other end of the subject matter spectrum, avoiding dull at every turn with pictures bound to get a laugh. He calls his body of work "Bent Objects," a nod to his sense of humor with a dual meaning. 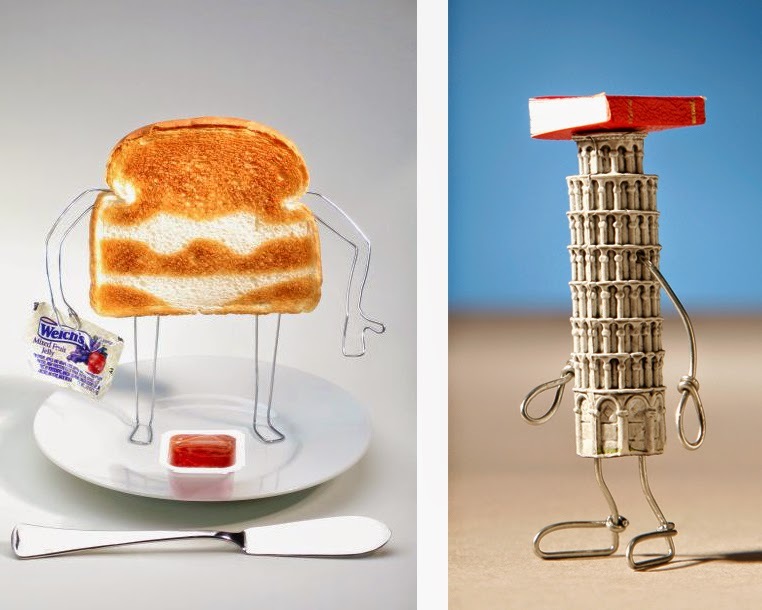 In a literal sense, he bends wire to turn everyday items into animate figures. Some of his favorites things to use as "bodies" are corks, peanut shells and other foods, but anything is fair game. He has become incredibly adept at shaping wire into a wide range of forms to complement, or rather supplement, these objects. Adding arms and legs, among other features, he also manages to bend our concept of these items, posing them in unusual scenes to tell a story. His masterpieces are therefore "bent" in the figurative sense too, comical, thought provoking and sometimes irreverent. Terry's photographic style is very clean, letting the focus remain on the figures he has created and the story they tell. One of my favorites features a slice of bread slathered in peanut butter proposing the another slice dressed in grape jelly, the perfect duo. 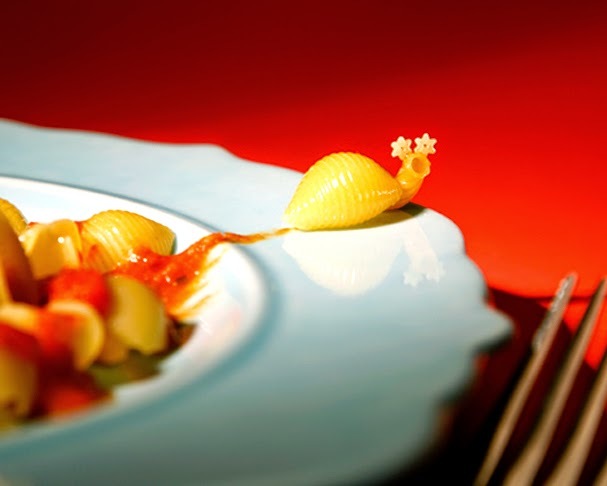 And what's not to love about a pasta shell posed like a snail trying to escape a bowl of tomato sauce. If only it could move faster and not leave a tasty trail. The beauty of Terry Border's art is one part Technique - high quality, well framed Photography, and equal part Vision - the fascinating and fun scenes he composes. "Bent" them may be, but that's what makes them great and feature worthy!